Although Kroger is the nation's largest supermarket chain, YouGov data suggests that title is under threat from a much younger competitor: Aldi. For the past five years, US consumers have shown an increasing fondness for the German discount grocer, with its many private-label products. Data from YouGov Profiles shows that 61% of Americans don’t think there’s much difference between leading brands and supermarket generics. In January 2013, for example, Aldi’s Impression score — which asks respondents if they have an overall positive or negative impression of a specific brand — was 15. Today, it’s nearly doubled to 29. Meanwhile, Kroger, which plans to release an earnings report later this Thursday, has remained relatively flat, averaging an Impression score of 30 throughout the same time period. A similar pattern appears when examining each grocer’s Satisfaction score, which gauges how many consumers consider themselves either a satisfied or dissatisfied customer. Since January 2013, Aldi’s score has risen from 15 to 26, while Kroger’s score has consistently hovered around 26. In other aspects, however, the smaller Aldi is now surpassing the larger Kroger. On YouGov BrandIndex's Purchase Consideration metric — which measures how likely consumers are to shop at a certain location when next intending to buy groceries — more American adults currently lean toward buying from Aldi (26%) than Kroger (23%). Another sure sign of Aldi’s building momentum: more and more consumers are talking about it. 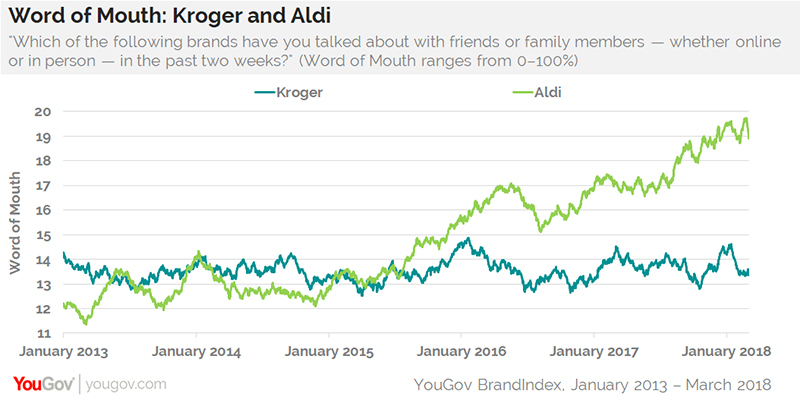 Indeed, YouGov’s Word of Mouth metric reveals that, at present, 19% of US adults recall discussing Aldi with friends or family members in the past two weeks, compared to 13% who report the same for Kroger. In total, data from YouGov Profiles indicates that current customers of Aldi are more likely to have a strict budget when they go shopping (68%) than current customers of Kroger (59%). Aldi customers are also more likely to say there isn't much difference between leading brands and supermarket generics (68%) than Kroger customers (60%).